Gingiber: what's love got to do with it? What's love got to do with it? 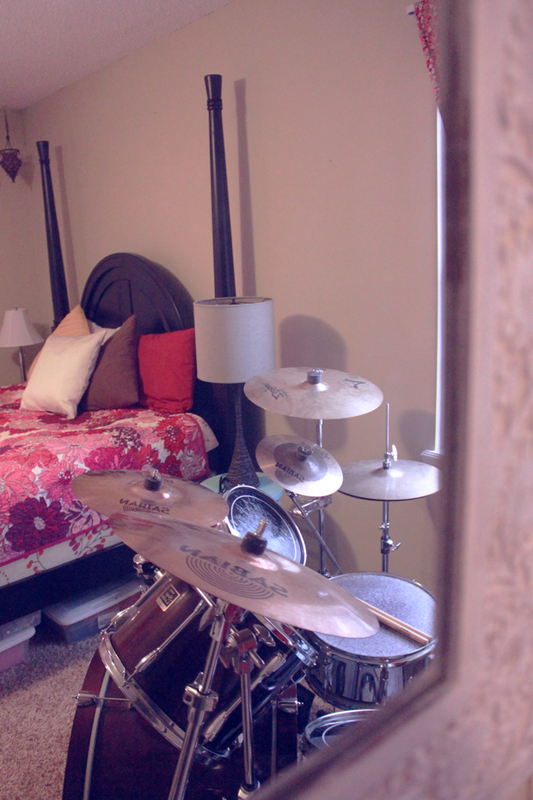 Everything, that is, if you are referring to my recent decision to set up Nathan's drum set in our bedroom. Let's backtrack a bit. When Nathan and I started dating, he was a happy go lucky college student, gleefully playing the drums and church and giving drum lessons to pay the bills. Somehow over the years, life intervened, and my sweet husband had to pack up his drum kit and put it into storage. It probably had something to do with moving to a small house, starting grad school, moving to a new state, having a child, etc. Fast forward to this year. Nathan is a focused mathematician. Math is what he does for fun! He is never without a pencil and a notebook, diligently working away at his math dissertation. Then an opportunity arose for Nathan to play the drums at the church we had started frequenting (shout out to Vintage Fellowship). I could tell that Nathan was rather pumped, but intimidated, as he had not played the drums in 3 years. 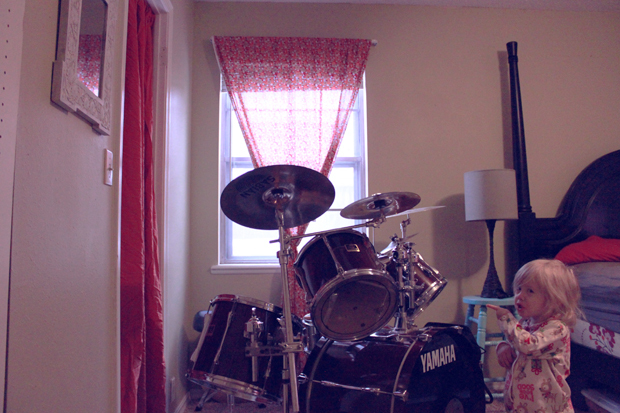 So yesterday, as we were snowed in, I decided that we HAD to find a place for the drums in our home. Having a 2 year old posed a significant challenge, as we could not set the drum kit up in the dining room or living room (little fingers and such). The only option was our own master bedroom. 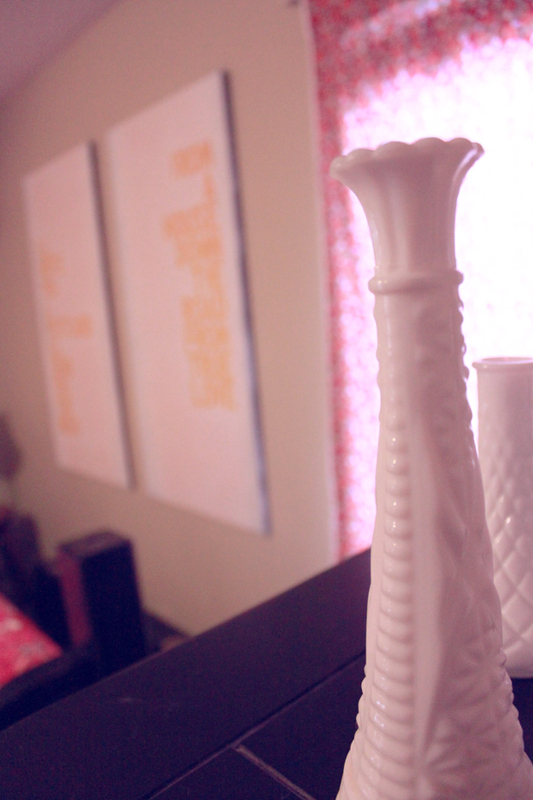 I like pretty things. Drums are not pretty. But these drums happen to be a maroon shade, which happens to sort of go with our bedspread (the lovely Liberty of London Quilt that just about EVERYONE seems to have bought last spring). I cleared out a large space next to the bed while Nathan and Violet were sleeping. When he woke up, I had pulled as many of the drum heads out of storage and put them in the corner, waiting for him to come set up! He is one happy husband. And I love him so much. And I want him to have a creative outlet again. So, in answering Tina Turner's infamous question: what's love got to do with it? Everything!